DE/VISION stem from the Darmstadt area and have been busy playing their predominantly electronic pop music with melodic English vocals since 1988. These professional musicians are 32 and 33 years old, respectively, and have long been considered a quantity to be reckoned with on the German music scene. The chart success of their third CD "Fairyland" marked the breakthrough of this hard-working and consistently touring band. Over 250 shows speak for themselves, and DE/VISION have been appearing with guitarists and a drummer to increase the live feel of their performance since 1998, making their gigs an aural as well as a visual delight. Musically, DE/VISION are changing all the time. While initially being influenced by the famous electronic bands of the day, they now cite the techno, trance, hip-hop and crossover genres as their current influences. 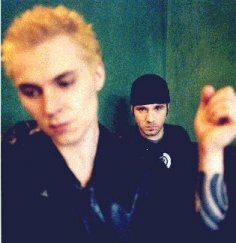 These days, DE/VISION themselves are an influence on the music scene and have been forerunners in many respects, working with vocal distortion effects as early as the beginning of 1996 - to be heard on their single "I Regret", and continued on "Strange Affection". Their output is nothing short of impressive: 10 MCDs and 7 longplayers in four years are only some of the products brought about by DE/VISION's tireless efforts. The band always remember their fans and like to express their gratitude, for example with two live videos/CDs, a 'Best Of' release and extensive autograph sessions after their gigs - after all their fans were the ones who first made DE/VISION popular via various radio and readers' charts and annual polls. These musicians know how to make timeless music. Their melodies are catchy, their lyrics sophisticated, the sound perfect. DE/VISION rely on quality, the love of detail, and on the fact that something new should still be discovered in a song even after hearing it for the tenth time. They have long been considered an insider's tip in Scandinavia, Spain and the US. Their music is international, therefore it may be a trifle difficult to describe your typical DE/VISION listener - all sorts of people like DE/VISION, and they all find that this band is very independent in their music and at the same time an aural delight. Since their move to major label WEA Records in 1997, DE/VISION have come up with new hit material. "Monosex" contained 11 potential singles with extremely varying structures that surprised a lot of people. And all those who worried that DE/VISION would allow themselves to be influenced by commercial considerations have been proved wrong - the step from independent to major record company has only served to motivate these likeable musicians. In the course of their "Monosex" tour, DE/VISION repeatedly performed in front of one thousand delighted fans, and the "Monosex" CD entered the Media Control Charts on no. 30, staying for four weeks. The first single release off the album made it to no. 47 and stayed in the charts for three weeks. DE/VISION celebrated their 10th band anniversary on November 17, 1998, with their CD 'Zehn (88-98)', a kind of best-of release (including a number of their own remixes). The subsequent club tour took the group abroad again (to Sweden, Norway, Holland, Switzerland and Spain). DE/VISION were able to enlist the support of the sought-after producer, Georg Kaleve, to help them record their CD "VOID" in autumn 1999. For five months, the group were busy producing new material in Berlin, and the result of their endeavours proves that DE/VISION continue to do justice to their forerunner role, producing innovative pop music that has set new standards and produced new focal points. "VOID" was released on February 28 (in 2000) and entered the charts on no. 33, while the single "Foreigner", out on January 31, made it to no. 76. The second single to be released off the album was the track "Freedom", which went down extremely well, also among non- DE/VISION listeners. At the end of February 2000, the group presented their new CD "VOID" live for the first time, selling out four of the five scheduled gigs, and the atmosphere at the venues proved extremely enthusiastic. An extensive tour of Germany followed in May, with the band - for the first time supported by a drummer - filling the nation's largest clubs and bringing the venues to the boil. On September 30 of the same year, keyboarder and musician Markus left, while vocalist Steffen, together with many other German artists, became involved in a charity project called Heal Yourself. Autumn 2000 saw the arrival of the 'Green Court featuring De/Vision' project, with vocalist Steffen releasing the song 'Shining' together with a DJ, catapulting the band back into the charts. The subsequent single 'Take' made it to no. 99 of the Media Control charts. The band moved to Berlin and changed to Drakkar Entertainment (BMG). The album called "Two" was released in October 2001 and reached again the sales charts followed by a long European tour. In 2002 DE/VISION released not only the Unplugged EP for the fans, they re-released a Live-Doubble-CD, and a Remixed-CD with their biggest hits from 93-96 on SPR-Label. In january 2003 DE/VISION released "DEVOLUTION", this time produced by Josef Bach. This cd continues the way of DE/VISION into the international market: From usa to russia, the cd is available. A tour just happened in germany but the recording of this tour will be available for everyone on cd "devolution tour - live 2003" (SPR) in autumn 2003, celebrating the 15 years anyversary of de/vision. The historical song "i regret" will also be released followe by wolrdwide concert activities.